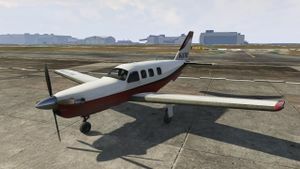 A Velum in Grand Theft Auto V.
The JoBuilt Velum is a light civilian aeroplane in Grand Theft Auto V and Grand Theft Auto Online. The Velum appears to be based on the Piper PA-46 family of light aeroplanes. The single propeller engine is enough to keep the Velum going, but nothing more. Manoeuvrability can be a challenge because of its poor power-to-weight ratio. Like most of the other propeller planes in the game, it has a tendency to sink nose-down. Parked at hangar A17, at the eastern end of the airport. Michael De Santa has to deliver a unique baby-blue Velum to Jimmy Boston in the Epsilon mission Delivering the Truth. This page was last modified on 13 May 2014, at 18:08.